JAS4PP is Java Analysis Studio for Particle Physics. 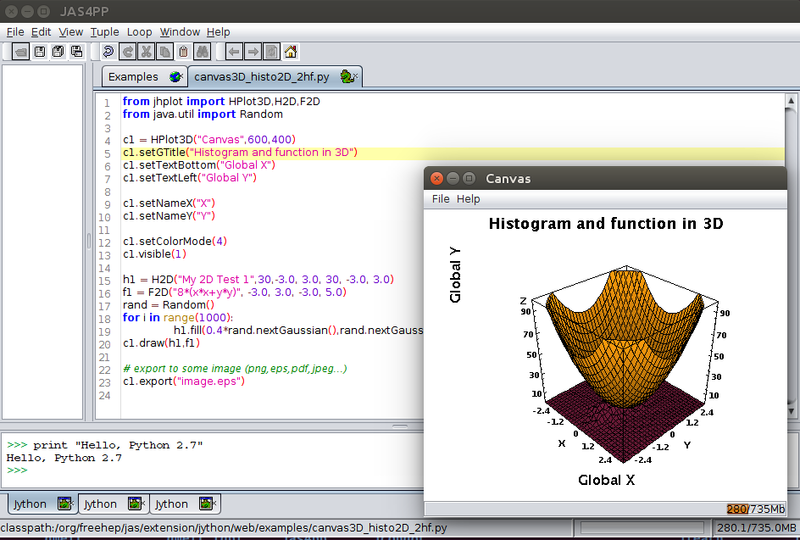 This program is based on Java Analysis Studio, JAS3, but extends this program for particle physics. JAS4PP was designed at ANL for detector performance and physics studies of future circular-collider experiments. Backward compartible with JAS3, an AIDA compatible data-analysis program. It includes only plugins for HEP, while other plugins were removed or redesigned. Includes Java libraries from the DMelt computational platform. Includes the GROOT project for data visualization developed at JLab. See GROOT wiki. Includes libraries ("hs-toolkit") to work with HepSim Monte Carlo repository. Supports ProMC and LCIO file formats. JAS4PP and associated code examples are licensed under the GNU General Public License v3.0. Less restrictive and commercially-friendly versions of the Java packages included in this program are available from the FreeHep and DMelt projects.